We LOVE breakfast in our home. Breakfast foods make our hearts sing. Sometimes, what is created in the kitchen is SO good, it becomes a blog post. Because, I feel greedy keeping this flavorful goodness to ourselves. I HAVE to share it with you. It is the right thing to do. 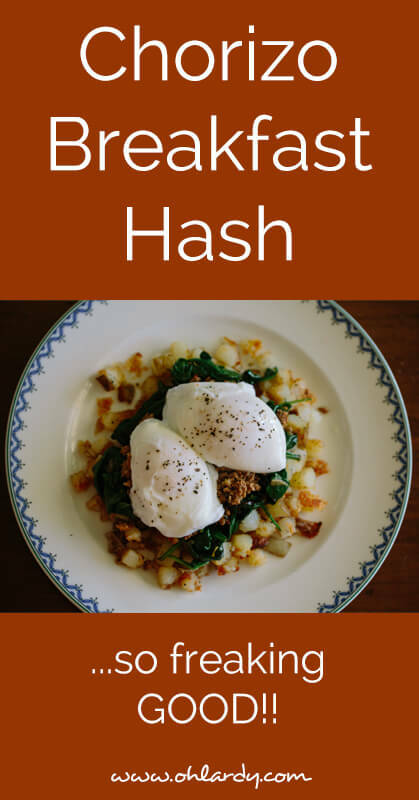 After finding some chorizo from our sausage guy at the market last weekend, my husband started dreaming up a breakfast hash. Understanding full well how much I enjoy the bacon hash that he makes, I started to get excited! True to form, he kept his creation simple. Five ingredients, plus a little salt and pepper, is all it takes to enjoy this delightful breakfast. This recipe can be scaled to feed however many people you need. So, you won't find specific amounts here. Boil the cubed potato until al dente. Drain and reserve. While the potatoes are cooking, cook the chorizo, remove from the pan, reserving the fat. In the same pan, add some olive oil and reserved fat and sauté some garlic. Add the fresh spinach to the pan and cook until wilted. Remove from pan. Add some reserved fat and sauté/fry the potatoes until they have a nice crisp. To serve layer potatoes, spinach, chorizo and then top with a poached egg or two. Feel free to use any kind of style for your eggs that you wish. 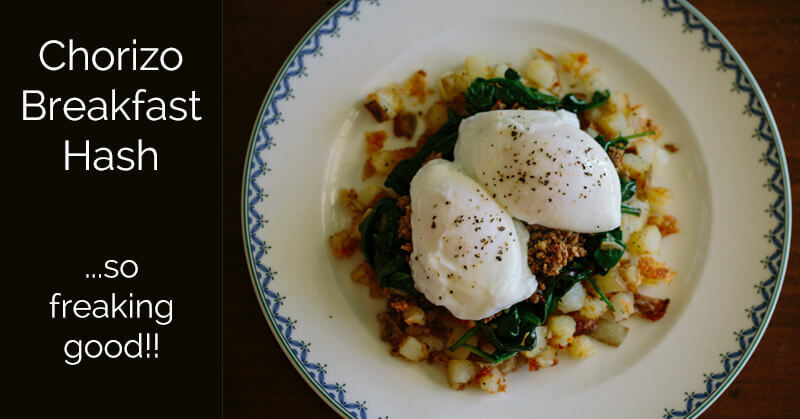 We just love the ease of poaching eggs. Sweet potato would probably be AMAZING as well! Your site is amazing. I have been on a very similar journey. The chorizo hash looks tasty. I haven’t tried it before but by just looking at it, I really want to try it. I love the fact that it is nutritious too. Thanks for sharing this, and the recipe too is easy to follow. I haven’t had chorizo hash in years. I’ll have to try this one.